Served this one up, nice and hot. 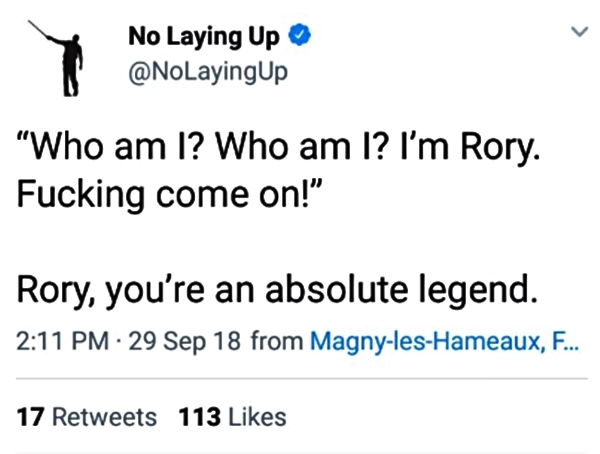 Rory McIlroy and Ian Poulter together on Ryder Cup weekend. That's one hell of a feisty team. The European teammates had varying fortunes on Saturday morning - McIlroy winning with Sergio Garcia while Poulter and Jon Rahm lost in the final fourballs - but they were hoping to recreate their magic from Friday afternoon. Poulter and McIlroy got off to a great start when they went 2 UP after three holes. 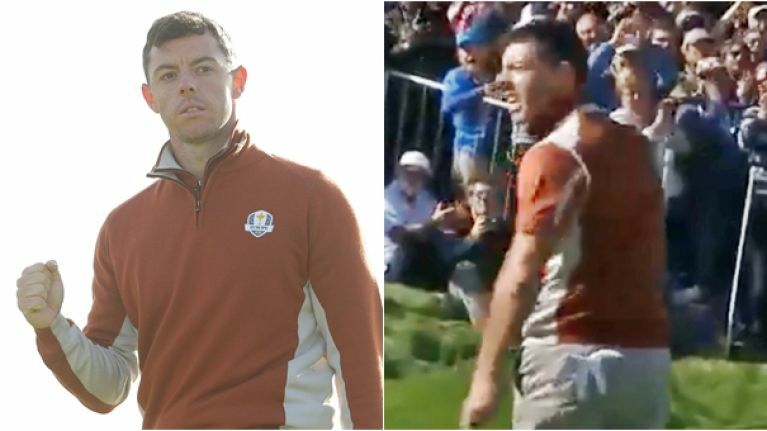 It was at the third hole that McIlroy had a spicy encounter with a bellicose spectator in Team USA colours. The fan mocked McIlroy as a poor putter and, when McIlroy sank his putt, he turned and faced him down. The response got a rousing reaction from the European fans that were packed around the green at Le Golf National's third hole. It was definitely a stand-off that shows how close to the action the fans are and how some are pushing their luck with the verbals. McIlroy may well have been too pumped up by the exchange, however, as he went way, way right off the fourth tee. Jordan Spieth and Justin Thomas took that hole to go 1 DOWN. The Americans won the fifth and sixth too and that section of the scoreboard turned from blue to red.